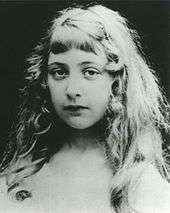 Agatha Christie (1890–1976) was an English crime novelist, short story writer and playwright. Although she wrote six romance novels under the pseudonym Mary Westmacott, her reputation rests on the 66 detective novels and 14 short story collections that she wrote under her own name, which have sold over two billion copies—an amount only surpassed by the Bible and the works of William Shakespeare. 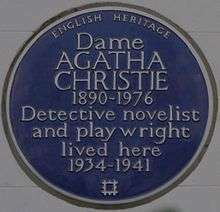 Her works contain several regular characters with whom the public became familiar, including Hercule Poirot, Miss Marple, Tommy and Tuppence Beresford, Parker Pyne and Harley Quin. Christie wrote more Poirot stories than any of the others, even though she thought the character to be "rather insufferable". Following the publication of the 1975 novel Curtain, Poirot's obituary appeared on the front page of The New York Times. The literary historian Howard Haycraft considered that "few fictional sleuths can surpass the amazing little Belgian—with his waxed moustache and egg-shaped head, his inflated confidence in the infallibility of his 'little grey cells', his murderous attacks on the English language—either for individuality or ingenuity." Christie was born into a wealthy upper-middle-class family in Ashfield, Torquay, Devon. She met her future husband just before the First World War;[lower-alpha 1] after he was sent to the Western Front, she worked with the Voluntary Aid Detachment, and in the chemist dispensary, giving her a working background knowledge of medicines and poisons. 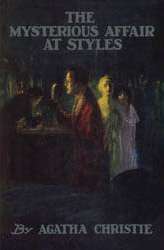 Christie's writing career began during the war after she was challenged by her sister to write a detective story; she produced The Mysterious Affair at Styles, which was turned down by two publishers before it was eventually published in 1920. Following the limited success of the novel, she continued to write and steadily built up a fan base for what Contemporary Authors calls "her unfailingly clever plots". She went on to write over a hundred works, including further novels, short stories and plays. Additionally she wrote two volumes of poetry, two autobiographical books and six romantic works under the pseudonym Mary Westmacott. 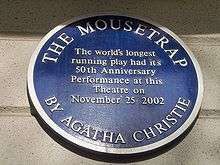 One of Christie's plays, The Mousetrap, opened in West End theatre in 1952 and, as at September 2015, was still running; in 2009 the London run exceeded 25,000 performances. In September 2015 a public vote identified And Then There Were None—originally published in 1939 under the name Ten Little Niggers—as the public's favourite Christie novel; the book was the writer's favourite, and the one she found most difficult to write. 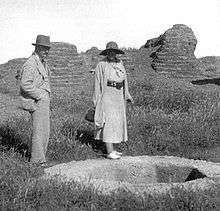 In September 1930 Christie married the archaeologist Max Mallowan, whom she met when she visited the excavations at Ur in Mesopotamia. The pair travelled frequently on expeditions, where Christie would help with the finds, and she used the experiences as a basis for her plots, including Murder on the Orient Express (1934), Murder in Mesopotamia 1936) and Death on the Nile (1937). She also wrote the autobiographical travel book Come, Tell Me How You Live (1946), which described their life in Syria; her biographer, Janet Morgan, reports that "archaeologists have celebrated ... [Christie's] contribution to Near Eastern exploration". Christie died in January 1976, her reputation as a crime novelist high. Her biographer, H. R. F. Keating, describes Christie as "a towering figure in the history of crime literature", while her obituarist in The Times considers that, following the death of Dorothy L. Sayers in 1957, Christie was "the undoubted queen of her profession". Initially in chronological order by UK publication date, even when the book was published first in the US or serialised in a magazine in advance of publication in book form. 1975 !1975 William Collins & Sons 1975 !1975 Curtain Dodd, Mead & Co Poirot !Hercule Poirot Poirot's last case, written in the 1940s. 1976 !1976 William Collins & Sons 1976 !1976 Sleeping Murder Dodd, Mead & Co Marple !Miss Marple Miss Marple's last case, written in the 1940s. Many of Christie's stories first appeared in journals, newspapers and magazines. This list consists of the published collections of stories, in chronological order by UK publication date, even when the book was published first in the US or serialised in a magazine in advance of publication in book form. Several of Christie's works have been adapted for stage and screen; the following is a list of only those works directly adapted by her or by a group of which she was a member. 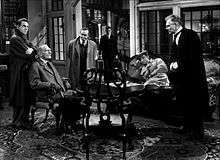 From left: Louis Hayward, C. Aubrey Smith, Barry Fitzgerald, Richard Haydn, Mischa Auer and Walter Huston in the 1945 film And Then There Were None, which was based on the 1943 play Ten Little Niggers. St James's Theatre 1943 !17 October 1943 1944 !1944 Samuel French Ltd. Based on the 1939 novel Ten Little Niggers; also known as And Then There Were None. Fortune Theatre 1951 !7 June 1951 1952 !1952 Samuel French Ltd. Based on the 1946 novel The Hollow. Ambassadors Theatre 1952 !25 November 1952 1954 !1954 Samuel French Ltd. As of 2015 the play was still running; in 2009 the London run exceeded 25,000 performances. Winter Garden Theatre 1953 !28 October 1953 1954 !1954 Samuel French Ltd. Based upon the 1925 short story "The Witness for the Prosecution"
Strand Theatre 1958 !22 May 1958 1958 !1958 Samuel French Ltd.
New York 1979 !1979 1973 !1973 William Collins & Sons First produced under the title Akhnaton and Nefertiti. Pitlochry Festival Theatre Company 2006 !1 June 2006 Unpublished. Written in 1931, but unperformed until 2006. Based on the 1925 novel The Secret of Chimneys. ↑ Christie was married twice. She married Archibald Christie in December 1914 but the couple were in divorced in 1928; she then married the archaeologist Max Mallowan and the relationship lasted until Christie's death. ↑ A chapter each was completed by: Canon Victor Whitechurch, George and Margaret Cole, Henry Wade, Agatha Christie, John Rhode, Milward Kennedy, Sayers, Ronald Knox, Freeman Wills Crofts, Edgar Jepson, Clemence Dane and Anthony Berkeley. G. K. Chesterton contributed the prologue. ↑ An abridged edition was published as The Mystery of the Blue Geraniums, and Other Tuesday Club Murders by Bantam Books in 1940. ↑ Republished in 1950 as Three Blind Mice and Other Stories. 1 2 3 4 5 6 Morgan 2015. ↑ "Poirot". Agatha Christie Limited. Archived from the original on 12 April 2010. Retrieved 10 June 2013. ↑ Haycraft 1941, p. 131. ↑ Engelhardt 2011, p. 83. ↑ Hall 1984, p. 6. 1 2 "The Mousetrap". Mousetrap Productions Limited. Archived from the original on 11 September 2015. Retrieved 9 September 2015. ↑ Flood, Alison (1 September 2015). "And Then There Were None declared world's favourite Agatha Christie novel". The Guardian. London. ↑ Hall 1984, p. 5. 1 2 Keating 1988, p. 71. ↑ "Dame Agatha Christie". The Times. London. 13 January 1976. p. 16. 1 2 3 4 Dalby 2004, pp. 32–38. 1 2 Keating 1988, pp. 68–71. 1 2 "The Floating Admiral". British Library Catalogue. London: British Library. Retrieved 1 June 2015. ↑ Fitzgibbon 1980, p. 45. ↑ Zemboy 2008, p. 144. ↑ Fitzgibbon 1980, p. 83. ↑ Dalby 2004, p. 37. ↑ Fitzgibbon 1980, pp. 98–99. ↑ "Behind the Screen". BBC Genome Project. BBC. Archived from the original on 11 September 2015. Retrieved 10 September 2015. ↑ "The Scoop". BBC Genome Project. BBC. Archived from the original on 11 September 2015. Retrieved 10 September 2015. ↑ "Theatre Parade: The Wasp's Nest". BBC Genome Project. BBC. Archived from the original on 11 September 2015. Retrieved 3 September 2015. ↑ "The Yellow Iris". BBC Genome Project. BBC. Archived from the original on 11 September 2015. Retrieved 3 September 2015. ↑ "Three Blind Mice". BBC Genome Project. BBC. Archived from the original on 11 September 2015. Retrieved 3 September 2015. ↑ "Butter in a Lordly Dish". BBC Genome Project. BBC. Archived from the original on 11 September 2015. Retrieved 3 September 2015. ↑ "Personal Call". BBC Genome Project. BBC. Archived from the original on 11 September 2015. Retrieved 3 September 2015. Dalby, Richard (June 2004). "Agatha Christie's Hercule Poirot". The Book and Magazine Collector. Diamond Publishing Group (243). Engelhardt, Sandra (2011). The Investigators of Crime in Literature. Marburg, Germany: Tectum Verlag. ISBN 978-3-8288-8560-8. Fitzgibbon, Russell H. (1980). The Agatha Christie Companion. Bowling Green, OH: Bowling Green State University Popular Press. ISBN 978-0-87972-138-1. Hall, Anthony (May 1984). "Agatha Christie, the Queen of Crime". The Book and Magazine Collector. Diamond Publishing Group (3). Haycraft, Howard (1941). Murder For Pleasure: The Life and Times of the Detective Story. New York, NY: D. Appleton-Century Company. OCLC 609578112. Keating, H.R.F. (1988). "Agatha Christie". In Benstock, Bernard; Staley, Thomas. Dictionary of Literary Biography: British Mystery Writers, 1920–1939. Detroit: Gale Research. ISBN 978-0-7876-3072-0. Zemboy, James (2008). 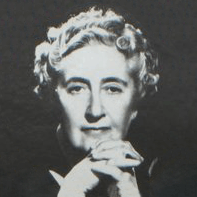 The Detective Novels of Agatha Christie: A Reader's Guide. Jefferson, NC: McFarland & Company. ISBN 978-0-7864-5168-5.